Ireland's Katie Taylor successfully defended her WBA world lightweight title with a unanimous points victory over American Jessica McCaskill. Taylor, 31, who beat Anahi Sanchez to land the WBA belt in October, topped the bill at London's York Hall. She extended her unbeaten professional record to eight fights with victory over the crafty 33-year-old. "It was probably the toughest fight of my career," said Taylor after taking the judges' cards 97-92 97-92 98-91. She added on Sky Sports: "I had to be at my very best. I knew she was tough and I was prepared for that. I did what I had to do and I am delighted with another victory." 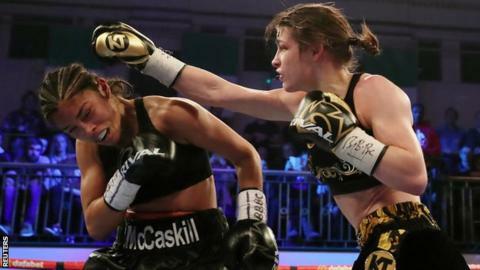 McCaskill has won five of her seven professional contests and tested Taylor at times in Bethnal Green, wobbling the Bray fighter in the sixth round. Taylor, who won an Olympic gold at London 2012, was then docked a point for holding in the seventh round. But Taylor out-boxed her opponent for long spells to keep hold of the belt she claimed at Cardiff's Principality Stadium, and is now turning her attention to unifying the division. "I would love to have a home fight in Dublin and unify the division," added Taylor. "I want to make history in this sport. This is the perfect end to a perfect year." Conor Benn extended his unbeaten professional record to 11 wins against Cedrick Peynaud, despite being knocked down twice in the opening round. The 21-year-old welterweight, son of former two-weight world champion Nigel, took a points decision 57-54 in the six-round bout. Benn was floored for the first time in his professional career when Frenchman Peynaud caught him with a right hand in the first round, hitting the canvas again before the bell. Benn responded to twice knock Peynaud, 31, down in the following rounds - despite sustaining a cut to his left eye - to take the decision. "Felt flat. Lost my bearings. Bit confused. Didn't listen. Lesson learned," he said. "Not the way I planned to end the year. Now back to the drawing board."